Research suggests that periodontal tissue might serve as a reservoir for oral human papillomavirus (HPV) infection, while another hypothesis is that chronic inflammation of the tissue might perpetuate an infection with oral HPV infection. In this narrative review, we summarize the evidence related to a potential association between oral HPV infection and periodontitis. Twelve articles were identified, and their key findings summarized. Studies vary in sample size, study population, study design, and methods for assessment of oral HPV and periodontitis. Although results are conflicting and still inconclusive, various studies have found an association between oral HPV infection and periodontitis, which is supported by biological plausibility. Future longitudinal studies should further evaluate this association, using clinical definitions of oral HPV infection and periodontitis, and focusing on high-risk populations for oral HPV infection. Studying this association is important since periodontitis might help identify at-risk individuals for oral HPV infection and potentially HPV-related oropharyngeal cancers. This work was supported by the National Institutes of Health [1R21DE024850-01A1, NIDCR] and [1R21DE027226-01A1, NIDCR]. Fuster-Rossello L, Ribotta E, Cuffini C, Fuster-Juan M. Human papilloma virus in oral mucosa and its association with periodontal status of gynecologically infected women. Acta Odontol Latinoam [Internet]. 2014;27(2):82–8 Available from: http://www.ncbi.nlm.nih.gov/pubmed/25523960. Bui TC, Markham CM, Ross MW, Mullen PD. Examining the association between oral health and oral HPV infection. Cancer Prev Res (Phila). 2013;6(9):917–24 Available from: http://www.ncbi.nlm.nih.gov/pubmed/23966202. •• Wiener RC, Sambamoorthi U, Jurevic RJ. 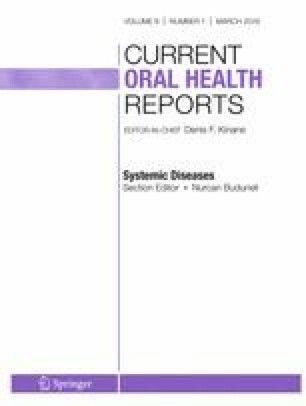 Association of periodontitis and human papillomavirus in oral rinse specimens: Results from the National Health and Nutrition Examination Survey 2009–2012. J Am Dent Assoc. 2015;146(6):382–9 Available from: http://www.pubmedcentral.nih.gov/articlerender.fcgi?artid=PMC4450443 This manuscript is important because it uses a greater sample size and establishes no association between oral HPV infection and periodontitis.